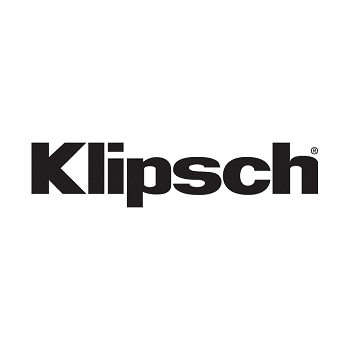 Klipsch has long been lording over the world of hi-fidelity audio equipment. Their foray into headphones was awaited with bated breath. It finally happened in 2007 when they came out with earphones. The Image line-up of Klipsch has been on the forefront of every audiophile discussion since their inception. Klipsch spends a lot of time perfecting a particular sound signature. Each Klipsch headphone may be designed keeping a different target audience in mind, but Klipsch pulls them all off equally well. Klipsch has a way with audio which they use to the maximum potential. Paul W. Klipsch’s unflinching vision of creating the world’s best speakers is carried on with the headphones by wrapping such sound in a tinier package. Are Klipsch headphones any good? The question is warranted since most of the casual listeners may have never heard of Klipsch. Their headphones demand to be heard with their guttural bass, natural mids and smooth highs. Most of the commonfolk yearns for bass and end up compromising by buying Beats. What if you have IEMs which blast the bass better than Beats? *Drumroll* Klipsch. They have the knack to kick up the bass without muddying your music.Their actual talents are highlighted when they are compared to other IEMs and headphones in the same price-range. Which Klipsch headphones are the best? Audio: Klipsch headphones are known to deliver big bass. Their puny IEMs are quick to pump up the energy by pushing the bass. 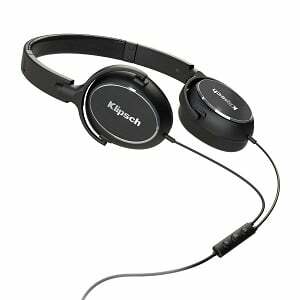 However, the best Klipsch headphones never allow bass to overstep on the territory of mids. Their reference-grade monitors are pristine to a fault. The clean sound is like a white sheet waiting for Picasso’s art of EQ. Design: Klipsch headphones are not best known for their architecture. The best Klipsch headphones are designed with cool aesthetics embracing the promise of long earphone life. Cost:Many times good headphones fail to match up with their price-tag. The best Klipsch headphones put maximum effort into avoiding this gaffe. The most sought-after earphones from Klipsch are the Image S4s. These tiny music machines managed to elicit both undying affection and vehement opposition from the users. They surely have done something right to deserve so much attention. The Klipsch Image S4i earphones are pretty much the same with the added capability to take a liquid splash. Being the best Klipsch headphones, they sound magnificent for the greenbacks you shed for them. Only caveat is you need to treat them like a high-maintenance girlfriend. Klipsch S4i earphones have enhanced bass, so audiophiles who worship balanced sound will not be amused. However, the bass is tightly reined in. Its majestic rumble is clean and well-defined and does not encroach on the midrange at any point. Bass is also not overpowering. In fact, for a casual listener, the S4is have the best bass setting. You need to burn in these Klipsch IEMs to get the best sound out of them. Once you do, you see the true nature of mids and highs assert itself. Vocals and guitars sound almost like the more expensive Monster or Shure earphones. The detailing of mids exceeds expectations from this price. They glaze over the kinks from bad recordings. Probably the reason S4i sounds good with bad formats is that it lacks treble extension. There’s a lack of sparkle to the treble which you will notice if you are looking for it. We are partial to the white/silver model of Klipsch Image S4i headphones. They look very chic to be worn in public. These earphones have straight eartips that sit inside the threshold of the ear canal. One amazing advantage is that the S4i’s have killer passive noise cancellation when coupled with the correct eartip. They cut you off completely from the outside world, except if you are in an airplane near the engine. The cable of these Klipsch earphones has flipped the lid off of many customers. It is just not meant to last. Fortunately they come with a 2-year warranty which can be utilized to your advantage. The cord has a 3-button remote, claimed to be the first to be fully compatible with Apply VoiceOver facility. Oval eartips in multiple sizes and a carrying pouch are part of the Klipsch Image S4i earphones’ box. Klipsch X20 earbuds are reference quality IEMs costing major buck. But the greens you shell out on them go into the ruler flat audio response that only full-sized cans can achieve. The wondrous sound is a sign of how far the audio tide has advanced if such a petite body can reproduce the original music, detail-for-detail. These earphones are best suited for audiophiles who are sticklers for razor-sharp audio with no adulteration. Klipsch focuses with single-minded devotion on creating a neutral response with the Klipsch X20 earphones. These IEMs are reserved for the upper echelons of purists who need their music to be a ditto of the original audio, even if it sounds flat or drab. Casual listeners might balk at the audio when they discover how it sounds without enhanced bass or sculpted mids, something only the best Klipsch headphones can ace. 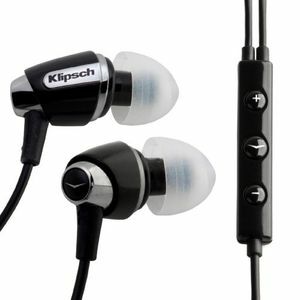 Bass has deep pockets in these Klipsch earphones, reaching right close to 5 Hz and growling there. When you play classical, the sultry undercurrent of bass provides a solid base for the instruments. Midrange tends to perfection with intricacies crafting it elaborately. Highs are ridiculously clean with adequate treble. No sibilance or distortion taints their audio. The X20i earphones by Klipsch have fantastic-looking exteriors fashioned out of dull metal glint and rubber finish. The black/grey architecture is simple yet alluring. This version also has a 3-button inline mic and remote that partners with Apple products. The cable is one aspect that both impressed us and bothered us. Cable has a clear outer cover through which you can see the wires. It looks uber-cool with the metallic ear pieces. Cable is also detachable. The weird part is that it does not detach at the driver housing. Rather, there’s a permanently-fixed strip of wire of small length from the ear pieces, which connects with the actual cable. This defeats the purpose of replaceable cable as the fixed part of the cable can get damaged and rob you of big cash. For a high-end earphone, the Klipsch X20i comes with just a leather carry case and spare eartips. They make Etymotic seem pretentious in terms of accessories. Klipsch is master at bass. They have always cornered other bass-heavy brands in the market and trounced them in terms of bass control. Klipsch R6 in-ear headphones are the prime example of how bass can be tamed to their tune. Regular music-lovers will love the lively performance of these earphones. They bring out the best in the music and forgive the flaws of bad recordings. All genres sound refined on one of the best Klipsch headphones. Klipsch R6 earphones sport an excited bass just like the rest of the Image line of Klipsch. Bass reaches deep in the low end and thumps thunderously in hip hop, EDM and techno tracks. There’s a definite spike in the mid-bass region, but the transition to highs is strictly controlled, so the bass does not spill. To create a sense of balance, these Klipsch earphones have colored the midrange. Its sounds warm and rich with details like a much more expensive earphone. Together, bass and mids bring more substance to the track, be it rock or classical. Treble suffers again with low detailing and some sibilance. Highs need more work from Klipsch. 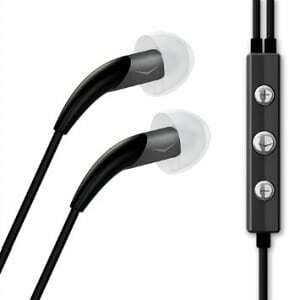 Klipsch R6 earphones are available in a number of variants. 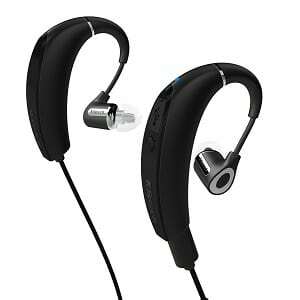 They come in models without mic, with buttons for Apple devices and with universal remote control (R6m). The universal remote version of these Klipsch earphones can also be used with PlayStation and Xbox. If that doesn’t sell you on these, then what will? These Klipsch IEMs feature off-kilter eartips that fit snugly into your ears. The body is highlighted with metal accents for a classy look. Their cord is the tangle-free straight type that faces some microphonics. It ends in a straight 3.5mm jack. The microphone of the version with inline controls has fairly good call quality. The magically noise-reducing oval eartips are shipped in multiple sizes with the Klipsch R6 earphones. A sleek pouch is also included. 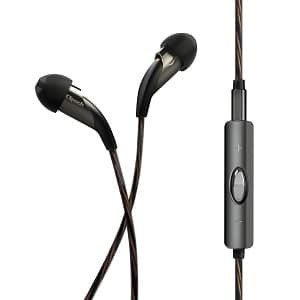 Klipsch Image X5 earphones cost a bomb compared to the lower-priced S4 and S3. However, they deliver on the promise of their cost-coordinate and sound absurdly pleasant. They can get almost as good as the X10s with some fine tuning. X5 earphones are all-rounders, maintaining a great camaraderie between the bass, mids and highs. All genres and music types are flattered by them. Unlike the S4s, bass is not enhanced in the Klipsch Image X5 earphones. They reserve a lot of punch and extend deep into the sub-bass realm with resounding thumps. But midrange is steered clear of the boom. Bass is moderately riddled with details of the low end. Midrange of these Klipsch earphones shines right alongside the bass. It is intricately woven and asserts itself confidently. The warmth of mids makes you appreciate the nuances of all kinds of music. Highs are crisp and clean. Treble matches the bass in every step, creating a lovely and balanced audio signature for one of the best Klipsch headphones. 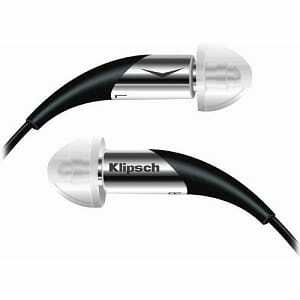 Klipsch Image X5 headphones have a tubular design with the name ‘Klipsch’ branded across them. With the letters carved on Aluminum, these earphones look quite suave. They match their price tag with their fancy looks. Eartips sit straight into the ears, closing out the mayhem around you. X5s are lightweight amongst IEMs. The fitment is pretty tight and highly comfortable for regular use. The cord of these Klipsch IEMs is long at 50 inches and features a slider to manage tangles. The plug is a curved L-shape that can absorb the stress from yanking. To vindicate their cost, the Klipsch Image X5 earphones come with an airline adapter, 3 sets of oval eartips, 2 sets of flanged-eartips, a couture case and a wax cleaner to remove earwax build-up. The Klipsch X10 earphones were hugely popular for their natural sound and punchy bass. However, Klipsch has discontinued these prized products and they brought in X11 to fill theirspot on the best Klipsch headphones list. They have both the mic and without mic versions of these IEMs which helps you make a more economic decision if you use earphones purely to enjoy music. At their current price, Klipsch X11 earphones are worth the money-bag. Stealing from X10’s DNA, these earphones cook up a meaty bass showdown. Bass is not enhanced like most earbuds of the Image line-up. Instead it’s an impactful presence behind its own boundaries. 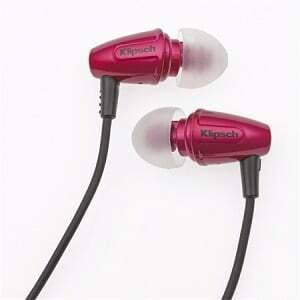 Mids have a smidgen more drama to them in these Klipsch earphones. Vocals and guitars are played out with great enthusiasm. You can get jiving at Santana’s guitar in no time. Highs are more subtle with the X11 earbuds. The frequency extension is up to 19KHz on the higher region. The tubular ear piece design makes a reappearance with the X11 Klipsch earphones. The driver casing tapers and curves as it approaches the cable. The blueprint is kept subtly high-class with a simple black design. The build looks more durable than the original S4s. The cable of these Klipsch earphones is ordinary. The X10i version has inline mic and a3-button remote control that work seamlessly Apple devices. The miserly entourage of 5 sets of eartips and a leather case with magnetic snap follow the Klipsch X10 earphones. Supra-aural headphone architecture is generally difficult to nail because it lies in the awkward middle ground between IEMs and over-ear cans. They have their own advantages though, when coming from a player like Klipsch. The Klipsch Reference R6 on-ear headphones are big bang for bucks with no pretenses, only performance. They are balanced enough to soothe your inner purist but funky enough to be pleasant. Klipsch R6i on-ear headphones violate the ‘reference’ tag in their name with a naughty boost of the low-end. Instead of puffing up mid-bass, they target the lower-end of bass. This underscores the music a little more superfluously than the usual bass-enhancement. Mids are emphasized to match up with the bass in these Klipsch headphones. A warm tone colors the mids to create pleasing vocals. There’s the slightest bit of bass-bleed into mids. Details are only about moderate in the midrange, as a result. The highs roll off before hitting sibilance, a common trend with the best Klipsch headphones. Klipsch relies on plastic for the construction of the R6 on-ear headphones. The quality of plastic used is at par with its price i.e. these headphones are not going to break on you before living out their worth. Plastic reduces their overall weight. There’s not much by the way of padding on the headband. Meanwhile earcups have a fair amount of cushioning to offset any clamping pressure. Ear pieces can swivel forward to adapt to your head shape. The cable of these Klipsch headphones connects to both the earcups. The inline control with mic lies midway between the earcups and the jack. Unfortunately, Klipsch sends a measly pouch with the R6 reference headphones and stops at that. Strong bass is one of the fundamental qualities of Klipsch headphones. The Image S3 earphones come from a line that is notorious for bass, but most importantly,famous for the control over the mighty power of bass. With the Image earphones, Klipsch cater’ to the casual music-aficionados. These do not have the balanced tonality of Sennheisers or Audio-Technicas but they sound fun enough to be on the best Klipsch headphones list. Bass is bumped a tad on the Klipsch Image S3 earphones. Audiophiles may snicker but usual consumers will not give a hoot. Bass has great energy that is evident in many of the happening tracks like Ready for your Love by Gorgon ft. MNEK. In spite of the bass boost, midrange is not muddied by bass. Bass has a great extension, stopping short of the mid frequencies on the higher side. Midrange does okay on these Klipsch earphones. They are detailed enough to match their price but not smoothed over. Treble is a bone of contention we have with Klipsch. It struggles to catch up with mids and bass to create the right balance. As a result, the audio response could come off as tinny for some of you. Some meddling on the EQ can set it straight. The Rebel Red version of the Klipsch Image S3 IEMs is how we like to play it. The shiny red metallic color peps up our mood just as much as the bass does. Eartips of these earphones are also angled away from the driver casing for a more ergonomic fit. They feature the oval eartips which sit more securely into the ear. If S3 sounds absolutely dreadful, it’s probably because of the wrong size of eartips. So keep in mind to pick the right sleeve for the ear pieces. The cord of these Klipsch earphones is a sturdy affair and terminates in a 3.5mm straight jack.It looks like it could afford the daily abuse of being stowed in your everyday bag. The Image S3 Klipsch earphones come with multiple sizes of oval eartips and a zippered carry case with a pouch inside.